Over the last few weeks East Jerusalem has been ablaze. With clashes, protests and killings taking place every other day, particularly in the beleaguered Holy City, the area is once again in the throes of conflict. While the mainstream media establishment in the west has chosen to portray these developments as another episode in the supposedly endless “cycle of violence” between Israelis and Palestinians, the nature and intensity of the escalation warrants a closer look. At the heart of the ongoing strife has been the question of access to the Al-Aqsa mosque. To understand the ferment in Jerusalem, one needs to reckon with the developments at Al-Aqsa over the last few weeks. 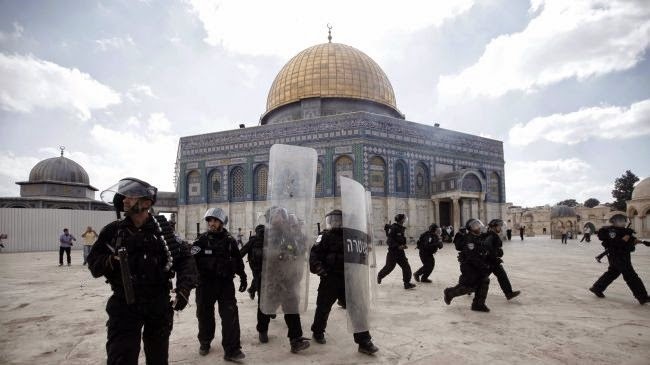 The Al-Aqsa mosque has occupied a central position in the history of Israeli depredations in Palestine. Regarded as the third holiest site in Islam, from where it is believed the Prophet ascended to heaven on his “Night Journey”, the Al-Aqsa compound also houses the Dome of Rock, one of the earliest and most exquisite examples of Islamic architecture. The place has significance within Judaism as well. The Temple Mount, as the Jewish community calls the mosque compound, is the supposed location of two Jewish temples in ancient times. It is this latter fact that has made the Al-Aqsa mosque a significant theological-political rallying point of the Zionist agenda in contemporary times. Since the time of the Ottoman empire, Palestinian Muslims have had exclusive rights of worship at the mosque, with other religious communities having the right to visit the mosque compound. Over the last few decades, with Israeli occupation of Palestine taking on an increasingly ferocious character, this traditional scheme of rights has been transformed into a political bone of contention. While earlier there was a wide consensus among Jewish theological interpreters that visiting the Al-Aqsa compound was forbidden for Jews, in more recent times sections of the Israeli right have increasingly projected Jewish “reclamation” of the Al-Aqsa as an inseparable part of the Zionist project. Radical right wing groups like the Haliba and the Temple Institute, which have grown over the years from being fringe elements to increasingly visible spearheads of the Israeli far right, have proposed a range of “solutions” – from partitioning the mosque, to dividing the mosque compound, to even demolishing the mosque. These groups have managed, through shrill and vicious campaigns, to make the agenda of Israeli “sovereignty” over the Al Aqsa a part of mainstream Israeli political discourse. This intensification of political venom by the far right has, of course, been supplemented by the active support of the Israeli state. In 1990, during the first Intifada, the Al-Aqsa compound was witness to the horrific butchering of 22 Palestinian protestors by the Israeli Border Police. Since then, aggressive presence of the Israeli state at the site has been periodically employed as an expression of the strength of the Occupation. In 2000, Ariel Sharon, in an obviously provocative gesture, entered the Al-Aqsa compound along with a heavily armed contingent of Israeli soldiers. This visit was one of the major symbolic offensives that triggered off the second Intifada, a period in which thousands of Palestinians were brutally slain, maimed or rendered homeless by the Israeli regime. Several restrictions on the right of Palestinians to offer prayers at Al-Aqsa, including curtailing the hours of visit and introducing lower age limits on the right to entry (since young Palestinians are seen as “security threats”), have been clamped from time to time. The recent turmoil over the Al-Aqsa mosque must be seen as a part of this long series of offensives. The backdrop of this escalation were the triumphalist declarations of Benjamin Netanyahu at the United Nations General Assembly held in New York in the month of September this year. Netanyahu, accusing the Hamas of being an ally of the ISIS, and the UN Human Rights Council of being “anti-Semitic”, made it very clear that the Israeli agenda of deepening occupation would only intensify in the days to come. He claimed that “settlers were not occupiers in the land of Israel” and referred to “a singular attachment to this land for over 3000 years”. This triumphalism served as a cue to several right wing settler groups to intensify their operations. Just a few days later, on 1st October, a group of settlers broke into and occupied 25 Palestinian homes in East Jerusalem, escorted and protected by armed Israeli soldiers. This occupation took place in a neighborhood close to the Al Aqsa compound. In the wake of these escalating state-sponsored adventures of the right wing, talk began to circulate that the Israeli government was planning to legislate changes in the rights of Palestinians to worship in the Al Aqsa. This sparked off rounds of protests by Palestinian worshippers in the Old City. The Israeli authorities responded by imposing serious restrictions on entry to Al-Aqsa, and majorly intensifying military presence in the area. It was clear that any resistance from the Palestinians would be met with brutal force. Meanwhile, the virulent right wing campaign on the question of Al-Aqsa continued unabated. Intensive multi-pronged canvassing built up the agenda of “reclamation” to the point of hysteria amongst certain Israeli sections, particularly in Jerusalem. On 29th October, Yehuda Glick, the head of Haliba and a prominent right wing radical, was shot at after delivering a lecture titled “Israel Returns to Temple Mount”. This emboldened the Israeli authorities to intensify the crackdown on Palestinian protestors. The very next day, the Israeli police entered the house of Mu’taz Hijazi, the “suspected” assailant of Glick and shot him dead. Hijazi was completely unarmed during the raid. Hijazi’s killing brought thousands of Palestinians to the streets, both in Jerusalem and the West Bank, with his funeral becoming a veritable protest march. Aggressive Israeli overtures at Al-Aqsa continued. On 30th October, the authorities completely shut down the mosque compound for a day. This was the first time that this had happened in years (Mahmoud Abbas, the head of the Palestinian Authority, called it an “open declaration of war”). A range of Israeli right wing leaders – from Uri Ariel to Shuli Mualem-Rafaeli – entered the Al-Aqsa compound over the next few days in clear attempts to further precipitate tension. On 5th November, in an attempt at provocation reminiscent of Sharon’s 2000 visit, a group of Jewish settlers forced their way into Al-Aqsa under the protection of Israeli soldiers. These assaults on Al-Aqsa were accompanied by brutal repression unleashed on the rising wave of protests against the same; the familiar and characteristic combination of foam-tipped bullets, targeted non-judicial killings, arrests, and torture, were employed extensively by the Israeli police. This repression was not restricted to the occupied territory. On 7th November, a 22 year old Palestinian, Kheir Hamdan, was killed in cold blood by the Israeli police in the town of Kafr Kana in northern Israel. Footage of the killing captured on CCTV, which got leaked to the social media and was then widely circulated, showed that there were no grounds whatsoever for the killing and that it amounted to a hard-nosed “execution”. This episode triggered large-scale protests by Palestinians on either side of the Green Line. The urgently fissile nature of the situation prompted the US Secretary John Kerry to enter into talks with Netanhayu, Abbas, and Jordanian King Abdullah II (Jordan had previously registered its protest against the transgressions at Al-Aqsa by recalling its envoy to Tel Aviv, the king being the formal custodian of the mosque). Kerry emerged from the parleys to announce on 13th November that “concrete commitments” had been obtained from all concerned parties to take steps to de-escalate the situation. This was followed by the removal of age restrictions on access to Al-Aqsa, and feeble assurances from Netanyahu, under international pressure, that the “status-quo” will not be tampered with. Subsequently, certain key rabbinical authorities including Rabbi David Yosef, head of Beit Hamidrash, issued a renewed call for the prohibition of the entry of Jews into the Al-Aqsa compound. The continuing violence in East Jerusalem exposes the hollowness of these gestures. An increasing number of Palestinians see the issue of Al-Aqsa as a symbol of the horrors of Israeli occupation. The current discontent in East Jerusalem stems from this larger sense of injustice. It must be remembered that it was right in the middle of the Al-Aqsa crisis – on 27th October – that Netanyahu pledged to build more than 1,000 settler homes in East Jerusalem. The Netanyahu cabinet has recently cleared a proposed legislation – the nation-state bill - which is designed to remove whatever vestige of secularism still informs the Israeli state by officially relegating Arabs in the country to the status of second class citizens. The apartheid war is alive and kicking. Some have claimed that the developments in Jerusalem potentially signal the commencement of a “third intifada”. Others believe that things are poised for the outbreak of a “religious war”. Whatever the merit of these claims, the ongoing turbulence in East Jersusalem, fuelled by the ever-intensifying colonial aggression of the Israeli state, may well have far-reaching implications.